يشكل فندق Healesville Hotel بموقعه الممتاز في قلب هيلزفيل نقطة انطلاق ممتازة لاستكشاف يارا فالى. إن موقعه الجيد الذي يبعد فقط عن مركز المدينة يساعد النزلاء على الاستمتاع بمعالم المدينة ونشاطاتها. يوفر الفندق بفضل موقعة الجيد وصولاً سهلاً إلى أهم معالم المدينة.
. إن الخدمات الممتازة وحسن الضيافة العالي في Healesville Hotel تجعل إقامتك تجربة لا تنسى. إن واي فاي مجاني في جميع الغرف, واي فاي في المناطق العامة, صف السيارات, مطعم, بار هي جزء فقط من الخدمات التي تميز Healesville Hotel عن باقي الفنادق في المدينة. استمتع بوسائل الراحة الراقية في الغرف أثناء إقامتك هنا. بعض الغرف تتضمن تلفزيون بشاشة مسطحة, اتصال لاسلكي بالإنترنت, اتصال لاسلكي بشبكة الإنترنت (مجاني), غرف لغير المدخنين, مكيف هواء لمساعدتك على استعادة طاقتك بعد يوم طويل. يقدم الفندق خدمات رائعة كمثل حديقة لمساعدتك على الاسترخاء بعد نهار طويل من النشاط والتجوال في المدينة. إن Healesville Hotel هو خيارك لخدمة الفنادق الراقية في يارا فالى. Beautifully restored room with attention to detail. Glorious high ceilings & comfortable bed. As there is no en-suite a hand basin in the room a plus. Even having to walk a short way to bathroom etc was not an inconvenience. Only minus was one of the bedside table lamps was not working. Love the spaciousness of the room. The guy who checked us in at 9pm was very friendly. The hotel has a long history, evident from the structure. Room does not come with a toilet. However, the 2 common toilets are spacious, clean and nicely decorated with flowers. Lovely presented room, beautiful local products supplied, very clean. If you are happy to have communal bathroom and keep blinds closed so neighbouring properties don’t look in then this is a great place to stay. Awesome location. Earplugs provided in case of noise but didn’t need them. our stay here was so incredibly lovely. Really beautiful rooms and perfect little touches. Loved the quaint cosy style of the heritage hotel ! Rooms were beautiful and comfortable (and huge) . There's a sink in there so basic washing needs are met, but toilets and showers are shared (very well maintained and equipped with all the basic needs). I was initially unaware of the shared toilet, and was quite disappointed about it - however other things made up for this mild inconvenience. The service staff explained that the layout was left unchanged due to the heritage status of the building - which I appreciate more than having an en-suite bath I suppose ! Food here is great - the dining room and the outdoor bar at the back is awesome too ! The rooms don't have ensuite bathrooms so you have to use communal facilities shared with the other travellers. If you don't fancy queuing up or pulling someone else's hair out of the plug hole this hotel isn't for you. It does say this in the small print on the website but it's so unusual not to have ensuite bathrooms that I hadn't thought to check. The windows aren't double glazed and it's on a main road so it was very noisy overnight and some of the staff were positively rude. That said the restaurant was good and the staff there were helpful and friendly. A place to eat but not to sleep. Need a better television in the room. We thoroughly enjoyed our stay in this authentic country hotel. Had a great meal at the restaurant. Ideal Yarra Valley location. Friendly staff. Room was large. comfortable. clean & beautifully decorated. Gorgeous set up with the old deco décor, and lovely touches of nice soaps, cushions, rugs etc. Could perhaps consider adding breakfast for the price and given the bathrooms are shared. Great location in the middle of Healesville town. Staff friendly and helpful, bar and restaurant great with a great selection of local produce, wines and beers. The hotel rooms were clean, but are old and out dated. The room I stayed in smelt strongly of kitchen aromas. I suspect the slow cooked lamb shoulder on the menu in the restaurant, wafted up into the rooms and corridors. Be prepared for a shared bathroom also, again clean, but not always convenient. I would describe the property as a 'Boarding House'. A very unfriendly check-in. Totally disappointing dinner in main restaurant. Our stay was redeemed by the atmosphere of the old hotel which has been retained and maintained beautifully. Vintage hotel with share bathrooms, where it not mention during review. Beautiful spacious rooms, wonderful staff, fantastic location! 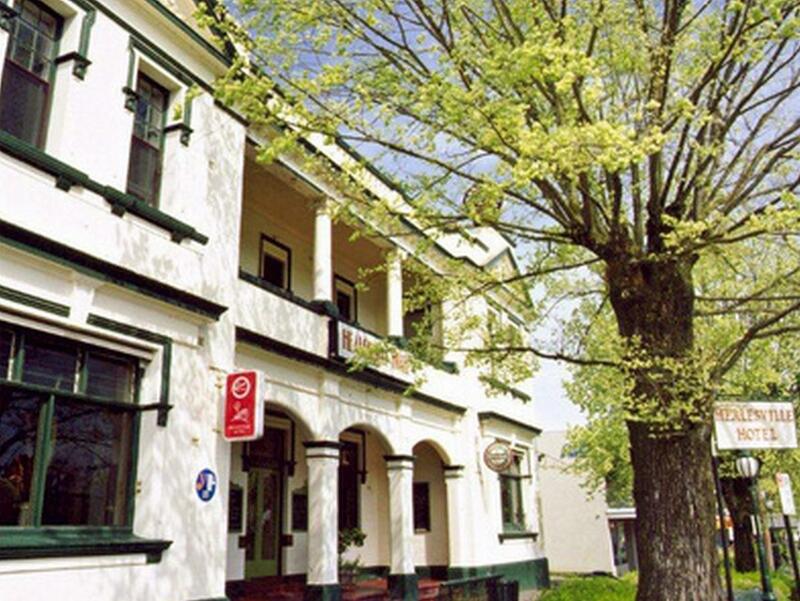 We couldn't be happier with our stay at the Healesville Hotel. The rooms and bathrooms were beautiful. The pub was so pretty, and the food at Quince Restaurant was amazing. All the staff were very friendly. Would highly recommend this hotel, and we hope to stay there again! Pleasant & clean, friendly staff. Old but not run down. The hotel is conveniently located and the interiors are aesthetically done. They should highlight that rooms do not have attached bathrooms. For a 4 star hotel, there is no concierge to help with luggage and the staff can try and be more helpful and welcoming.